The Jousting tournaments of the Middle Ages were entertainments devised by rich nobles to enable knights to practise their combat skills in mock battles or in single combat using weapons such as the jousting lance. Tourneys provided a training ground for Medieval knights who could attend Jousting tournaments and demonstrate their combat skills with the sword and the jousting lance and delight the ladies with their code of Chivalry. There were therefore weapons used in jousting tournaments, such as the jousting lance, which were designed to be less lethal than the weapons used in real combat situations and on the battle field. The jousting lance was used as the major weapon in Medieval Tournaments. The jousting lances were tipped with a coronal. This was a crown shaped metal cap consisting of three or more blunted metal prongs. The purpose of the coronal was to allow the lance to catch and hold on to the shield, making it easier to unhorse the opponent, or break a lance on him. A lance rest was protruding arm attached to the breastplate of the jousting armor to take off some of the weight of the lance when jousting. The Jousting Lance used at tournaments were designed to reduce the number of potential injuries to the knights. The purpose of the jousting lance used at tournaments was to unhorse a rider in single combat, such as in the "joust for peace"
The jousting lances were tipped with a coronal. This was a crown shaped metal cap consisting of three or more blunted metal prongs. The purpose of the coronal was to allow the lance to catch and hold on to the shield, making it easier to unhorse the opponent, or break a lance on him. 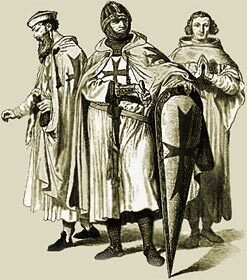 The Jousting armor used during the Medieval times of the Middle Ages varied according to the financial status of the knight. Jousting armor was extremely expensive, as was the conventional suits of armor, so many knights only owned one suit of Medieval Knight armor which was used for battle and for jousting armor. Jousting Armor was developed specifically for the joust. This type of armor had heavier protection on the side toward the opponent and lighter or no protection on the other side. Another style of Jousting armor had a built-in shield on one side of the waist, just at the point where the lance should strike. Other types of Jousting armor was designed to break apart on impact, leaving the rider in the saddle and reducing the possibility of injury. A jousting helmet called a 'frog-mouthed helm' was a specific piece of Jousting armor. The helm had an eyeslit at the upper part of the helm, so the knight could lean forward to see, but straightened at the moment of impact so the lip protected his eyes from splinters. This was an extremely useful piece of Jousting Armor as many, often fatal, injuries were sustained by knights - the eye of King Henry was pierced by a sliver that penetrated the brain, from the shattered lance of his opponent. This event is detailed in the section relating to the Medieval Jousting History. The Medieval Times website provides interesting facts, history and information about knights of old which scatter the Medieval History books including the subject of the Jousting Lance. The Medieval Times Sitemap provides full details of all of the information and facts about the fascinating subject of the lives of the people who lived during the historical period of the Middle Ages. The content of this article on Medieval life and times provides free educational details, facts and information for reference and research for schools, colleges and homework for history courses and history coursework.